1. How much meeting technology does the average company really need? I know this is an obvious answer, but planners need just enough technology to meet the requirements of each component of their meeting. For example, a marketing road show needs to have email marketing and search engine optimization tools in order to drive attendance to their events. A mandatory employee training event, however, only needs an email broadcast capability in order to communicate with the attendees, and sometimes Outlook can serve those needs. The planner needs to start their analysis with the business requirements and processes, then select technologies that streamline these processes, and then use the features of the best technologies to modify the processes in order to take further advantage of their technology investment. Process requirements drive technology selection, but technology capabilities can drive process changes. 2. Hotels are increasingly providing meeting technology for their clients through their own websites or in collaboration with companies like Passkey. Is that all some organizations need? Hotels typically limit their technology tool offerings to electronic RFP submission and rooming list management. For some meetings, these are sufficient, but most professional meeting planners must deal with more complicated situations requiring their own technology. For example, if your attendees are going to stay at multiple hotels, you will likely need to have a single system recording your event’s housing reservations, instead of flipping between each hotel’s own housing application. Also, planners need to be aware that hotels’ proprietary tools, such as RFP / meeting space search, are designed to drive business to their properties. You won’t always find the best deal for your meeting by sticking with the hotels’ tools. 3. What's been integrated so far? Why were those areas/ partners chosen and how difficult was it to accomplish? In general, the industry has seen Registration systems integrated with housing systems such as Passkey, travel systems such as corporate booking tools (GetThere, ResX) and GDS’s (Sabre, Worldspan), customer relationship management systems (PeopleSoft, Salesforce.com), employee/human resources databases (Peoplesoft), and credit card processing networks (Paypal, Authorize.net) – in addition to many other integrations with niche applications. The effort involved in these integrations vary greatly between partners and processes. Credit card processing, for example, is a fairly mature technology with established standards and so was the first (and easiest integration) for most registration companies. We need to make a distinction between technical integration and business process integration. For example, if you want to pass a name from your employee database to the registration system, then you will likely need a technical integration between these two systems. On the other hand, if you want to use email broadcast, blogging, and search engine optimization in order to drive traffic to your event, then you can likely use three different applications without doing any technical integration. You only need to synchronize your use of these technologies as you seek attendees. Lastly, technical integrations must be maintained. Even though we first integrated Certain Registration with credit card processing in 1998, we spend at least one release every year maintaining that integration - adding new processors, dealing with mergers such as Verisign and Paypal, updating to the latest security standards like Payment Card Industry compliance. 4. What's next in integrating meeting technology? How long will it be before we see any of that -- by the end of 2009? The next phase of integration will be deep support for programming tools loosely called “Web Services”. Web services provide an interface for other applications and computers to interact with our product. For example, if you want to change your last name, a human user can log in and manually update their last name using an online form. Or the employee database, which already has a record of the name change, can contact the registration application and update the last name for a specific person – automatically and without human intervention. Many suppliers, including Certain, offer “Web services” to a limited extent now, but you will see all vendors expand their support to allow integrating systems to do anything that human users can do. Another longer-term trend will be the adoption of data exchange standards such as the APEX (Accepted Practices Exchange) and OTA (Open Travel Alliance) XML (Extensible Markup Language). This will allow a single application to interact with a wide market-place of other applications, without having to re-write application code and establish business partnerships with one company at a time, as is the time-consuming norm today. 5. What reasons do meeting planners or travel managers give when they turn you down and say they don't need Certain software to help them? Inertia is the biggest issue if we are competing against an existing in-house system or process. Although managers recognize the inefficiencies in their existing processes, they sometimes cannot generate the internal motivation to change to a better system. Cost should never be an issue, since Certain Registration as a Software As A Service (Saas) product offers pay-as-you go plans with little up-front expenses. Some planners cannot adopt our products due to company policies or internal issues trying to integrated with other in-house systems, such as employee or customer databases. Although technically Certain can and has integrated with many types of systems, the internal resources on the client’s side may not be available and put the entire project on hold. I heard today that nTag emerged out of its December 2008 bankruptcy in the arms of Alliance Tech. While I admired the nTag technology and founders, I was never fully convinced of its value relative to some of the pricy products and services offered. In general, I think that Social Networking as applied to face-to-face meetings is in its infancy, and we are seeing some products over-priced and some over-hyped. But in the long run I think that someone like Alliance Tech is going to hit the right value proposition and finally put Social Networking into the professional event planners' standard toolkit, along with online registration, Web sites, site selection, and email marketing. AUSTIN, Texas – March 23, 2009 – Alliance Tech http://www.alliancetech.com/, the leader in RFID enabled event measurement, announced today the company has acquired the technology and assets of nTAG, a pioneer in face-to-face social networking technology and the creator of the world’s first interactive name badge. The acquisition of nTag’s technology further strengthens Alliance Tech’s position as the leader in event marketing intelligence, and will add significant value to the company’s overall portfolio of offerings. A cornerstone feature of nTAG’s solution is real-time monitoring that provides event directors with dashboard views on session, exhibitor, and event evaluation, interaction levels among attendees, as well as networking connections shared between attendees. Evaluating these activities allows planners to make necessary adjustments onsite and for future events. Additionally, conference managers are able to effectively engage and communicate with attendees, as well as have the ability to view information on what attendees are doing during the conference. Event attendees who use the wearable technology benefit from targeted networking opportunities via networking contests, real-time audience feedback and increased satisfaction from better connections. The nTAG technology has been used at events for IBM, Procter and Gamble, Alcatel-Lucent, WellPoint, MasterCard, General Electric, Freescale Semiconductor, Bristol-Myers Squibb, Pfizer, and many others. Alliance Tech will assume nTAG’s assets, and will retain key staff to ensure a smooth transition and consistent implementation of each solution. nTAG is now on solid financial ground, as Alliance Tech is rated 1A1 which is the best credit rating of Dunn & Bradstreet’s business appraisal system. Alliance Tech enables companies to increase their return on investment (ROI) of tradeshows, conferences and events through an industry leading marketing intelligence platform. Alliance Tech is the leader in intelligent events that utilize radio frequency identification (RFID) to track attendee interests and preferences. Alliance Tech solutions include RFID attendee reporting, lead management, surveys and social networking. Alliance Tech is a two time winner of Corporate Event Marketing Association’s (CEMA) technology shootout award, and the 2008 Top Technology Supplier by Meeting Tech Online. To learn more, visit http://www.alliancetech.com/. In 2001, the Information Technology Industry Council partnered with the General Services Administration to create a tool that would assist Federal contracting and procurement officials in fulfilling the market research requirements specified in Section 508 (governing the accessiblity of Web sites and software applications to disabled users). The result of their collaboration was the 508 Evaluation Template – a simple, web-based checklist that allows Vendors to document how their product did or did not meet the various Section 508 Requirements. Today, I finally got around to producing a Voluntary Product Accessibility Template (VPAT) document that defines our committment to Section 508, which I've blogged about many times. Recently, we have seen versions of the VPAT attached to several RFPs from various federal agencies and public institutions, so it appears to be heading towards becoming a standard first step for 508 Compliance evaluation. Now we are at the point with Section 508 compliance where we were in 2001 with PCI compliance (self-assessment). Over time, I expect that we and others in our industry will move towards fully-audited compliance and independent reports for Section 508, as we now have with PCI level 1 compliance. 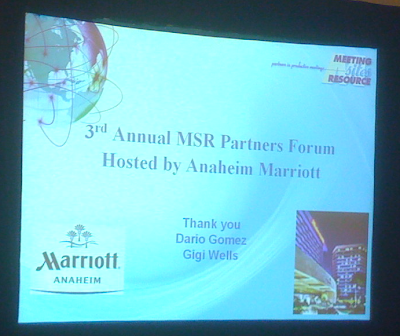 On march 12th, I attended the Meeting Sites Resource Partner Forum in Anaheim. Tim and Jennifer Brown and their son Rob Wilson have built a great site selection company, and they hosted a first-class event. Because Certain is focused on the meeting planners' perspective, it was interesting for me to see the events industry from hoteliers' viewpoint. I also enjoyed seeing the new features for hotels in Meeting Evolution, their new web-based application for Site Selection and Event RFP management. Exchanging cancelled meeting space - A great idea, right? The event had two round-table brain-storming discussions. The first was on the benefits and issues involved in trying to broker cancelled meeting space to companies that could use it. In theory, taking cancelled meeting space and re-selling it to another group seems like an effective way to offer discount meetings to a new group while saving cancellation penalties for the original group. After listening to these discussions, however, I believe that in practice the concept of re-using cancelled meeting space can only work profitably when exchanged within a single organization. Only very large organizations would need enough meeting space to potentially be able to switch groups into cancelled space without changing the contract with the hotel. And these companies tend to cancel a large number of their meetings at once, as is happening now during the current recession, making it less likely that the cancelled space can be re-used on a broad scale. 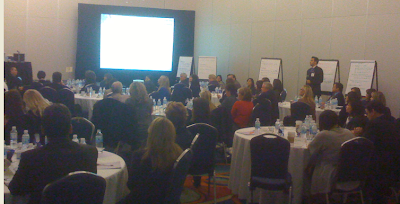 I've read a lot of sales pitches about the benefits of re-selling or exchanging cancelled meeting space. It's worth a shot to try doing so internally within large organizations, but I don't think I'd want to be in the business of brokering cancelled space among different organizations. If someone has a proven way of doing this profitably, I'd love to hear about it. The second round table discussion covered changes in hoteliers' business practices in this recession. During the 2003-8 expansion, many hotels' ownership structure changed dramatically. Hedge funds discovered that they could buy hotel chains, sell the land, lease the buildings to franchise owners, hire hotel management companies, and move hotels under different brands. This created a profitable re-organization of assets for a while, but now that occupancy rates are falling and cancellations are rising, the sales managers at my table discovered they have multiple owners, with conflicting goals. During the 2001-2 downturn, one sales manager received a call every day from her boss, imploring her to drive more business into their hotels. But now she gets calls from three "bosses" each day. The first comes from hotel owners who want business driven to their property, not caring about the other properties in the same brand who may be a better fit for the business. The second call comes from the hotel management company, who wants her to maximize sales and profit across the entire chain. The third comes from various brands, who want leads to come into their brand over others. With the media mania about companies hosting "extravagant" events at resorts, high-end brands are competing for business that previously would have gone to mid-range brands, who in turn want the business of economy brands. Somebody made billions re-organizing the hotel industry, but I think a chain who owns and manages it's hotels and brand could have an advantage in this market over the complexity of multiple competing "owners".